Almost every bike has at least one gear shifter. Only the single-speed riders will not really be interested in this category. For all others, we would like to explain here, what you must pay attention to in order for the switching command of the finger to also get to the drive exactly as you would wish it. Basically, you must differentiate between flat bar gear levers and switching units for the road bike handlebar . While the shifting units for the road bike handlebar (socalled STI units) are vertically fastened to the handlebar and are simultaneously used for shifting and braking operations, flat bar gear levers are mounted to straight handlebars for the MTB or the trekking bike and are only used for shifting gears. Combined shifting and braking units, such as they used to be available in the 1990's for MTB, are only seldom found noways for straight handlebars since most handlebars can meanwhile be connected visually precise to appropriate brakes from the same company. This is also something that should be paid attention to if you care for an orderly cockpit. Since the 1990's, the combined shifting-braking unit for the road bike has replaced the classic shift levers which were mostly located on the downtube. Only a few models, e. g. travel bikes or time trail bikes still have separate shifers and brake levers. 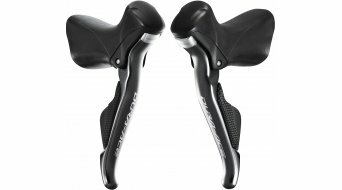 The three major, market-dominating manufacturers Shimano, Campagnolo and Sram offer matching levers for every group set. This should always be observed since although you can use an 11-speed Dura Ace shifter with a rear derailleur from the 105 or Ultegra series, but you cannot drive a 10 speed Shimano Utegra nor any rear derailleur from Campagnolo or Sram with it. Of course, it is the same with the levers from other manufacturers since they use different actuation ratios respectively. Accordingly, this means that a specific disctance is travelled with every "click" and it must match the rear derailleur and the front derailleur in order for the system to be able to accurately switch via the entire cassette. Therefore, you must necessarily pay attention to the compatibility! In the last years, electronic group sets have been introduced such as Shimano Di2 , the Campagnolo EPS systems or the new Sram eTAP. The issue of the compatibility applies especialy to them, since in this case not the tension but the cable and the matching control electronics make the difference. At gear levers for straight handlebars, there are two dominating manufacturers, namely Shimano and Sram, who offer 2 1/2 different gearshift types. Why 2 1/2? Since the turning handle (also called "grip shift" or "twist shift" from Sram) has its very own control logic at which the gear is changed by turning the grip, that is why we only count it half of the times amongst the "levers". 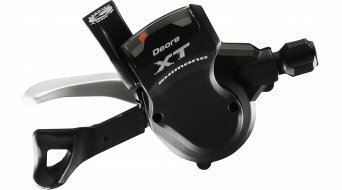 While the Rapidfire models from Shimano as well as the triggers from Sram receive their switching command by means of pressing the finger onto a lever. At both manufacturers, the larger, bottom lever switches to a larger sprocket or chain ring and with the small lever to a respective smaller one. The small difference between the levers: At Shimano, the small lever is operated either with the thumb or the index finger parallel to the large lever and at Rapidfire-Plus models, you can even change two gears at the same time, while at Sram, the lever has an operating direction which is shifted by 90° and in general only changes one gear. With the large lever, you can change several gears. It is up to you which of the two gear lever variants agrees more with your ergonomics. If required, isn't it anyway the rotary handle, which can rapidly change the gears in each direction, but which is harder to integrate into the cockpit? No matter which alternative you choose, you have to pay attention in any case that the switching handle fits your drivetrain. In this case also, the actuation ratio is the difference. At Shimano, it is not important for the mechanical groups whether you ride with a 2 speed or a 3 speed crankset, since the same gear lever works with both variants. The gear levers for the front derailleurs are offered in the 10 speed groups as 2 speed and 3 speed versions. Naturally, there is no left shifter for 1 x 11, neither from Shimano nor from Sram. Of course, the gear levers for gear hubs from Rohloff or even from Shimano should not be forgotten. I-Spec and matchmaker also are terms, which you could come across in connection with MTB gear levers. They represent the respective installation standards of the two large manufacturers for combining gear lever and brake to a unit. The I-Spec is from Shimano, and of course only for Shimano, while the Matchmaker is the equivalent from Sram. Both are available in several variants. One item more that you have to pay attention to, but at the same time also a very interesting option in order to design your cockpit in a more orderly way.